I hope you are all having a good Monday. 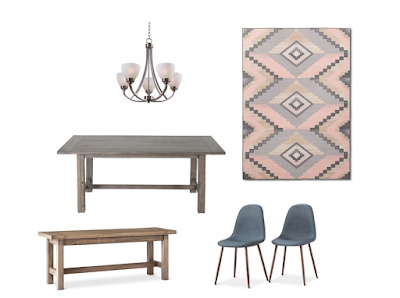 Today I am going to show you the concept design for our dining room. Our kitchen is mostly cool colors but we have bits of pink and red to add in some warmth. The rug still has our cool colors but ties in our warm colors as well. On top of the area rug we have a wood table. I really like the look of wood tables and have been searching for one that will fit in with our kitchen color scheme. I came across this gray farmhouse table that has a matching bench! I love the idea of having a bench for seating. For the other seats I want to add in these modern blue dining chairs. The legs look like wood but are actually metal and the tops are nicely padded. I love that they add some color and keep the modern feel of our kitchen. Above the kitchen table I want to add in a chandelier. I saw this one and thought it would match our kitchen appliances nicely but I don't feel like it fits in with the dining room very well.